Marketing communications is an elaborate marketing strategy that can loosely be described as the art of combining different marketing channels and tools in combination. Thus, it is (vaguely) understood as all the messages and media deployed to communicate with the market. Marketing communications are comprised of a marketing mix that includes Price, Promotion, Place, Product, People, Physical Evidence, and Process. The marketing communications tools can vary from advertising, direct marketing, branding and packaging, PR activities, sponsorships to personal selling. Handling marketing and communications is not a simple task. It involves layers of multiple channels and strategies to communicate with the target market. Thus, when developing an effective marketing proposal, some essential elements should not miss from the plan. A strong proposal is what will win you the new businesses while allowing you to stay on course with the current ones since it will act as a point of reference to establish objectives, expectations, and successes. When you are developing a proposal, take into account the client's goals and objectives. You should also take into consideration their business style. Thus, there is a need for intense research on your prospective client. You can get the information by directly asking the potential client about their strategic objectives for the foreseeable future (even though this can be a hit or miss). It doesn't also hurt to study the products or services the prospective client has in the market already. These products and services can provide valuable information on who they are designed for, and what needs they address in the targeted market segment. You should also research deeply on the market conditions including the client's opposition with regards to promotion and product differentiation. 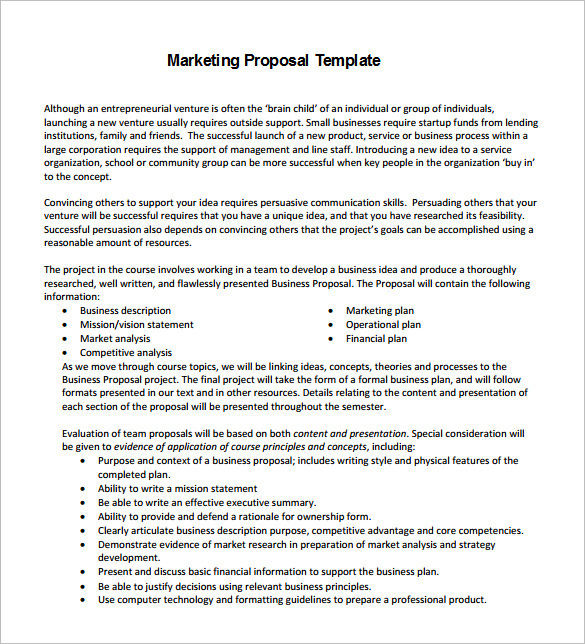 The next step of developing the marketing communications proposal is to write a brief executive summary. You can now prepare an executive summary based on the research on your prospective client. The administrative review sums up the potential client's situation from your professional angle. You can then highlight the solutions you will offer concerning the findings made in the preliminary research. The answers can include the approach you will use depending on the demographics the proposal targets. You may provide insight without going into in-depth details. The executive summary can also act as the situational analysis of your proposal. This part is the segment of the marketing communications proposal that addresses the potential client's company goals in further detail. Thus, you will define the client's goals as you understand them, taking time to break them down further into primary and secondary objectives. You will also outline the steps you plan to make to address these expectations and meet the prospective client's goals. This step is crucial as it lets the potential clients see that you have made time to find solutions that are tailored toward their marketing communications needs and that you aren't presenting another template proposal to win their business. Let them know that you understand what needs to be done to meet their goals. You should also offer a value proposition – detailing how you will measure your success in the marketing campaign. The proposal should have the goals broken down further into jobs that will be executed. The features include the personnel who will handle the campaign, the timelines and the platforms you plan to use. You should explain these details in text as well as visual formats, with diagrams to illustrate what you are describing. This approach allows the prospective clients to understand your approach better, giving you an edge over a marketing communications proposal that consists of plain text. Finalize the plan with the estimated costs and the estimated time it will take to carry out the project as well as anything you will need from the prospective clients in a bid to ensure success.